In this category you can find my 2D graphics. 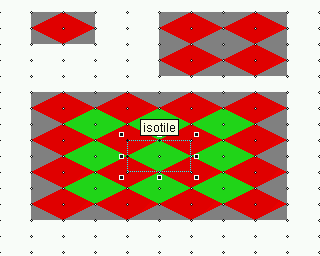 The mayour part of it is in a special isometric format. i am using a 16 dot grid to fit the tiles, and my iso is a 4:3 one. Here a short ecxursion to the World of the Standard 2:1 ISO Tiles . Well, i am using a so-called Quick Backdrop for large areas. This one fills the area. 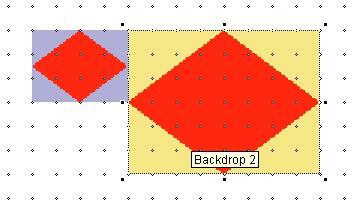 Using the rhombus shape would mean to use two of the Quick Backdrops over each other. I don´t like it this much. So i also fill up this grey Areas and i have a rectangle one insetad. Finally there was this relative Flat-looking 2:1 Iso. I wanted to have something more Toplooking. And so i decided to develop my 4:3 Iso Format. Even with the 4:3 one you would be able to use rhombus shaped Tiles. The Grid for that would have 32 to 24 Pixel. 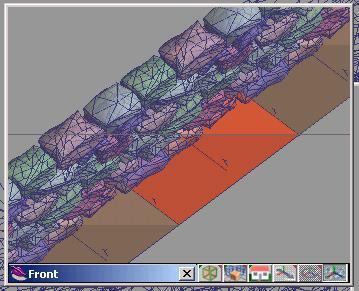 I told you why i don´t like to use Rhombus Tiles. 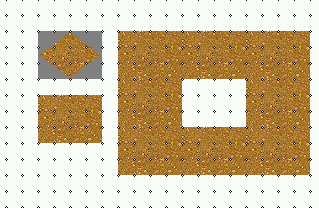 The now rectangle tiles fits to a 16 dot Grid. This also gives me more freedom to place all my othe levelstuff. My Trees for example. It simply looks more irregular with the 16 dot grid. And i have to do this to all wallpieces, to get a fitting wall. In this way all the walltiles would have the size of 128 X 288 Pixel. Not really comfortable, because a lot of tiles would overlap in the later game with its transparent areas. And there would be a lot of useless just transparent areas, that simply rises the needed ram space. Always make the tiles as small as possible. And because of this i am cutting away those useless transparent border areas, using gridsteps. Here you can see what i mean. This would be the tileset if i would leave it uncutted. Very big, very uncomfortable … and a lot of not needed transparent areas. 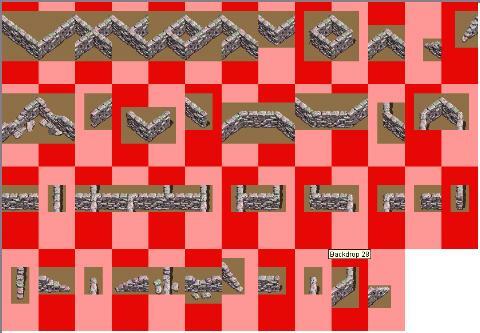 I have used red and pink to show where one tile ends and the next begins. Always a tile of 128 x 288 pixel. Everything red and pink is stuff to cut away. The stuff with the brown background is the later tiles that you can find in the finished tileset. really lots of areas to cut away. 2. 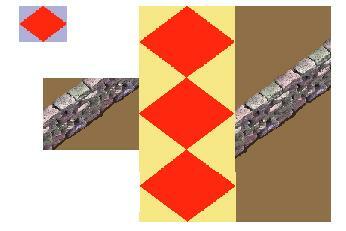 Then there are the pieces for frontview: one front, one upwards, the four corners and the crosspieces. And also here the endpieces. Besides from that, the design is nearly the same to all wall like things in the new iso sets. Well, as told, one sprite does have a lot of single pictures. And there is a lot of useless border around the sprite. This is because a attacking sword should also be displayed at the tile. MMF provides a way to reduce the picture to the visible area. The red border is cut away then. MMF takes care that the drawing point is still the same than in the not cutted picture. They call it Hot Spot. This reduce to visible area reduces the memory size dramatically. So it is a good idea to use it. 2. You could reduce it to the visible area, and record the Hot Spot position for every single frame. 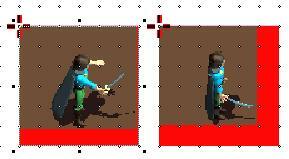 My swordstan for example shrinked down from 10 mb to 4. 4 mb by reducing to visible area. Truecolour.